Birds chasing other birds is a natural part of the avian world. But when you add a skilled falconer, that pursuit can disperse pest birds from airports and amusement parks, and protect a farmer's fields. A blueberry farmer in Washington State pays a licensed falconer to scare birds, mainly starlings, away from his crops. Barbary Falcons, like this one, are often engaged to dive-bomb starlings and other pest birds, and can save the farmer three to four tons of blueberries every day. One more way that birds benefit people! Birds chasing other birds is a natural part of the avian world. But when you add a skilled falconer, that pursuit can protect a farmer’s crops. Once the sport of kings, falconry has taken on a practical side, most notably to disperse pest birds from airports to prevent bird/aircraft strikes. The best-suited birds of prey are Peregrines, goshawks and Aplomado Falcons [Call of Aplomado Falcon]. A blueberry farmer in Burlington, Washington, has hired a licensed falconer to keep birds, mainly starlings, from feeding on his crops. Pee Wee*, a Barbary Falcon, along with his dozen cohorts, can save the farmer three to four tons of blueberries every day. Using his ability to stoop at up to 100 miles per hour, Pee Wee dive-bombs clusters of starlings, scaring them away from the newly ripening blueberries. After about 20 minutes of work, Pee Wee is whistled back to his trainer. Falcons are also keeping pest birds in check at vineyards, amusement parks, landfills and even in city centers. [Call of Aplomado Falcon] Often the falcons are trained, but in some cities wild falcons have taken up residence, to feed on the overabundance of starlings and pigeons. Trained and wild, falcons are adding a new chapter to the long story of birds benefiting people. Sounds of the birds provided by The Macaulay Library of Natural Sounds at the Cornell Lab of Ornithology, Ithaca, New York. European Starlings and Cooper’s Hawk recorded by G.A. Keller. American Robin recorded by R.S. Little. Aplomado Falcon recorded by Alvaro Riccetto, courtesy of Xeno-Canto. Editor's note: Not long after we did this story, Pee Wee decided to broaden his horizons. Handler Fred Seaman says: "It's a shame that he never returned from his flight. We did everything possible to find him with the radio tracking but never recovered the signal. His brothers, sisters and cousins are still working on various jobs." 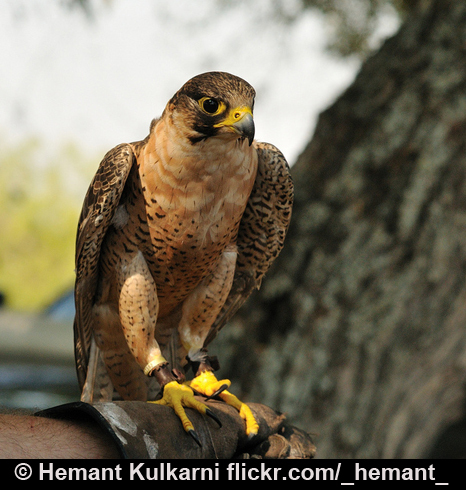 Read more about falcons & vineyards!